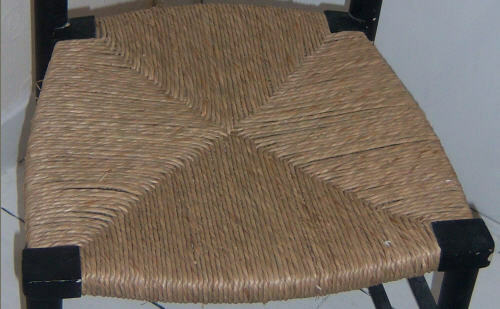 You have an old rush, cane, seagrass or cord chair, or maybe a set of chairs. They’re attractive pieces of furniture, and maybe they have considerable sentimental value, but you can’t use them any more because the seats are broken. But of course you don’t want just to throw them away. Our chair repair service gives you another option. For a very modest outlay you can have your old rush, cane, seagrass or cord chair professionally restored by a master craftswoman whose passion for her work and attention to detail have delighted a wide range of clients the length and breadth of Scotland and beyond. Take a look at the pictures below to identify which kind of chair you need repaired, then go to the “About Us” page to find out about prices and getting a quote. You can contact me on 01674 959435 or rosarchibald61@hotmail.com. Traditional rush chair. Note the distinctive seat pattern with four triangles meeting in the middle. 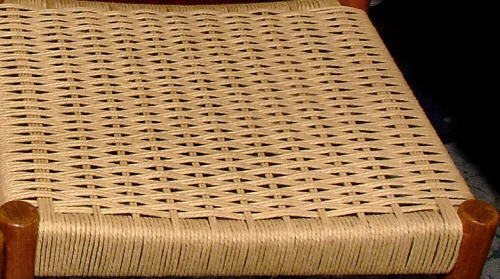 A cane chair seat is distinguished by a pattern of small hexagons constructed from six strands of cane. 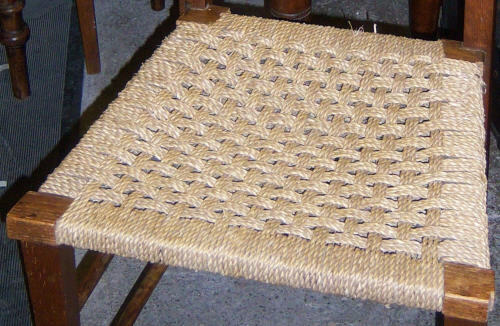 Seagrass chair seats are woven from the fibres produced by a marine flowering plant that grows underwater in shallow beds. Danish cord is a durable chair seat finish woven out of three ply twisted paper cord.